Minahasa societies have high traditions and culture. Unquestioned Waruga is one proof. Waruga location we visited is located in the village of Sawangan, Airmadidi subdistrict, Minahasa regency, North Sulawesi. Waruga is the tomb stone shaped like a house. It has 1 meter width and height of 1 to 2 meters. The top of the lid as the bottom ridge of the house and found a box-shaped space in it. 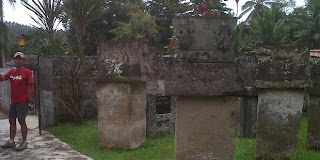 Thus, the Minahasa ancestors are not buried in the ground, but put in a stone box. One family has at least one waruga made by a member of the family. Make waruga is starting from choosing the stone, chiseling to fit the body shape to put into it. There is even a story that the body goes into Waruganya own (!). 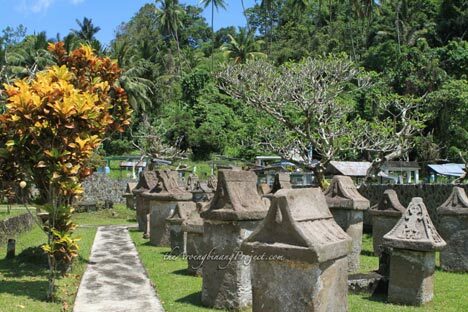 The body should be facing North Minahasa tribe signifies ancestors who came from the North. Use of Waruga began around the 9th century. And it is banned around the year 1860 due to outbreaks of typhoid and cholera that was allegedly derived from that waruga at the time. The unique of waruga is in some it is found carved on the ridge one animal picture. Apparently it's carving a family than as a marker, also described the profession of people who are buried in it. For example, pictures of animals are the hunters had means of his profession. These warugas in Sawangan village contained the relocation of several places. These tourist sites are also used as a common grave. In the entrance there is relief on the left and right. Relief is about the process of making and using Waruga. Before visiting the Sawangan village I did lay on Waruga. I've never even heard of before. It was eyeing opening and insightful visit this attraction. The more love and proud to be the nation's taste!